Big George Brock is a native of Grenada MS, who grew up near Clarksdale, doing the hard field work that was the only employment opportunity for many residents of this agricultural area. In the 2006 film “Hard Times” he visits plantations where he worked and describes how hard picking cotton was. Brock started playing harmonica as a child, and in his teens started to perfrom on weekends. The area was a place where, Brock says, “The blues grew like grass out of the ground.” Those are the kinds of places where musicians acquire the magical ability to sing the blues — and where they leave for better opportunities of any other sort. Brock’s blues is gritty and raw, the musical diamond in the rough that great country blues can be at its best. 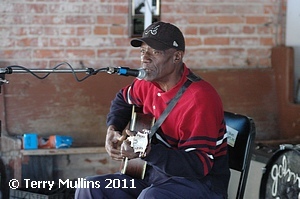 Jimmy “Duck” Holmes is a native of Bentonia MS, a place noted in blues history as the hometown of Skip James, who recorded in 1931 for the famed Paramount label and enjoyed success during the folk-blues revival of the 1960s. 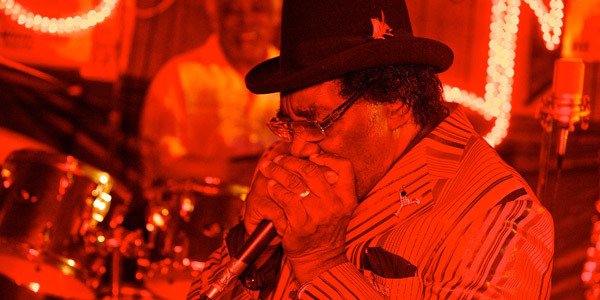 The “Bentonia style” of blues, played in minor tunings and employing falsetto-tinged singing, led to world recognition for Skip James. It is a unique mix of mournful and joyful overtones, and Holmes is its major surviving exponent. Holmes and James were both strongly influenced by Bentonia players Jack Owens and Henry Stuckey. Holmes credits Stuckey, who was never recorded, with being the originator of the Bentonia sound. He learned from both Stuckey and Owens. In the 2012 film “We Juke Up In Here” Holmes says he has a special feeling for juke joints because he was “born and raised in a juke joint.” Actually, his parents bought The Blue Front cafe in Bentonia when he was one year old, so he wasn’t born there, but was certainly raised with the club, which he continues to operate to this day. 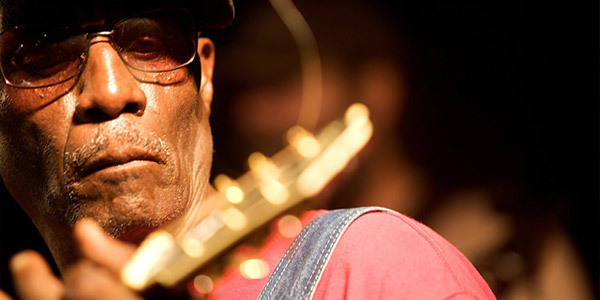 Holmes absorbed the blues from his earliest years in the club, where he also learned to survive and navigate through the hardships and contradictions of life for black people in Mississippi. His club sold moonshine, but not Coca Cola, which was reserved for whites until the 1960s. Holmes founded The Bentonia Blues Festival in the 1970s, and by the 80’s, The Blue Front Cafe became a popular place to visit for blues tourists from Europe and Japan. 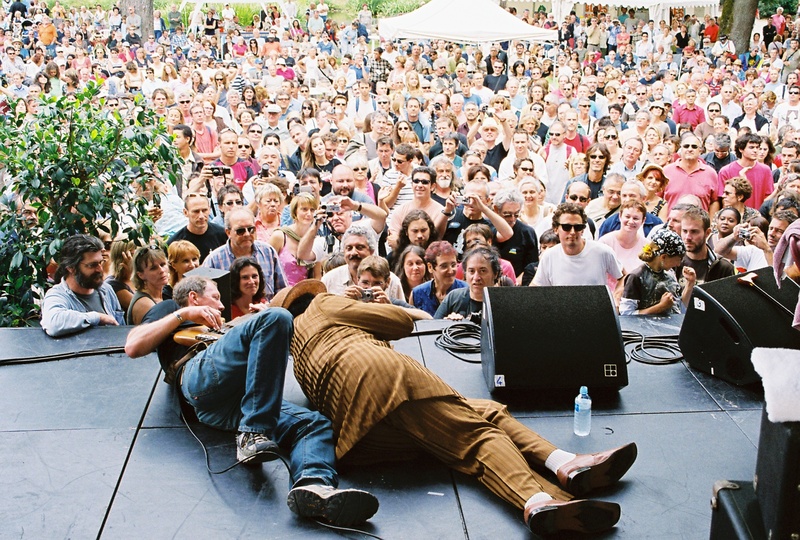 Holmes rarely performed outside of the club until the 1990s, and the few recordings of his music were issued only overseas. His reluctance to fly on airplanes has undoubtedly prevented him from capitalizing more on his popularity in Europe. His full-length debut album for Broke & Hungry Records in 2006 “Back to Bentonia” made him better known and led to festival bookings around the United States. 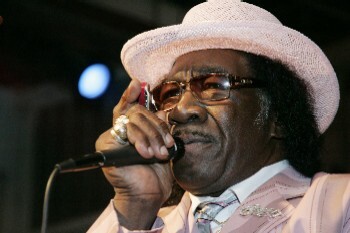 His second album “Done Got Tired of Tryin'” was nominated for a Blues Music Award from The Blues Foundation. A blues historical marker on The Mississippi Blues Trail was placed at The Blue Front Cafe in 2007, and Holmes and the club are profiled in the 2008 documentary film “M For Mississippi: A Road Trip Through The Birthplace Of The Blues.” How did he get the nickname “Duck?” Jimmy “Duck” Holmes says, “I don’t have the slightest idea.” By the time blues researchers were asking him that question, his parents, who may have known the answer, had passed, and he has had the nickname all of his life.